Review date: 24 November 2005. LED flashlights used to have a problem with brightness. That problem was: They didn't have a lot of it. Individual 5mm LEDs, which is what all LED flashlights used to use, are now good for maybe one tenth of a watt of power each. The latest models (as seen in lights like this and this) output about as much illuminance as about two-tenths of a watt of reasonably efficient halogen incandescent lighting. So if you want the same output as a standard, cheap, 50 watt halogen downlight lamp, you need 250 top-flight recent-model 5mm LEDs. To match an incandescent flashlight with a good two watt bulb in it, you still need 10 of those LEDs. Or twice as many, if you're using older or cheaper versions. The most powerful LEDs you can get at the moment are, of course, much beefier than any 5mm model. Lumileds Luxeon III LEDs chug along happily at three watts with moderate cooling and will run a fair bit brighter if you heat sink the heck out of them, and so they've shown up in various flashlights. When I say that "they" have shown up, I of course mean that they've shown up in various different lights, not that they've shown up en masse in one light. There's only one Luxeon LED per flashlight, obviously. Six, count 'em, six, Luxeon III LEDs. The minimalist "Emitter" type, to be precise, not the "Star" type that comes mounted on a hexagonal circuit board. Each LED has its own little silvered plastic reflector, and they're all crammed into the end of a converted Maglite. Regular readers will be unsurprised to learn, or may already know, that this monstrosity is an Elektro Lumens product. It's called the Tesla-6, and it's the most outrageous member of a made-to-order family of lights that also includes the Pentalux and QuadStar. Elektro Lumens have some well engineered, beautifully made, highly desirable LED flashlights in their range these days. The current Blasters may have an uncouth name, but they're a brilliant product that anybody would be happy to own, and do not look in any way home-made. Unlike the Tesla-6, which looks and feels like what it is - an exercise in handcrufted extremism. Elektro Lumens know how to do this, because they started out like a lot of other small-business LED flashlight makers - jamming LED lamps into the ends of other people's flashlights. Maglites are the most common victims of this sort of operation, because they're quite cheap and solidly made. The only thing wrong with them is that they all still use boring incandescent bulbs, even in lights like the tiny Solitaire (which is a lousy product, entirely because of its minuscule tungsten filament globe). The lamp end of the Tesla-6 is a simple enough thing; it's essentially just an aluminium plug with the LEDs thermal-glued onto it. The reflectors just sit on top of the LEDs, and are held down by the plastic lens of the lamp, which doesn't quite screw all the way down any more. As hacks go, it's actually a pretty good one - the LEDs are positioned just right so that the middle reflector, which is recessed, is held in place by the reflectors around it, and everything's locked down nicely by the lens. Is it still waterproof? Uh, probably not as much as you'd like. But fresh water won't do the lamp any harm, and salt water will be OK too as long as you don't leave it sitting in there for weeks. Like many retrofitted Maglites, this one doesn't have an adjustable beam any more. You're stuck with an approximately 16 degree wide beam (neither very narrow nor very wide) with a wide spill outside it. It's a good compromise, though, especially when you consider how bright it is. Extend your arm in front of yourself and spread your fingers, and your hand's covering an area about the size of the T-6's hot spot, but there's plenty more outside that. Here's the T-6 lamp, as I received it. Elektro Lumens make this light in two flavours. 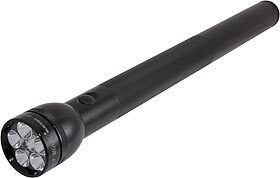 I got the one that's built into a six-cell Maglite (6C or 6D); like a lot of Elektro Lumens lights, it simply connects its lamp directly to the batteries, using the batteries' internal resistance to limit the LED current. There's another Tesla-6 version that's made out of a three-D-cell light, though. That one uses adapters (like the one used by the Blaster Junior) that replace each D cell with three series-connected AAs. This second light, therefore, runs from nine cells. They absolutely must be NiCd or NiMH, since running a bunch of Luxeon IIIs from a string of alkaline AAs is probably forbidden by the Geneva Conventions. Look at the PDF datasheet for a top quality AA alkaline and you'll see that its absolute peak bleeding-from-the-eyes discharge figure is one amp; eighteen watts from nine cells is at least 1.3 amps, and actually a lot more when you take high current voltage sag into account. So the total string voltage for the 9-AA version is nine times the nominal 1.2 volts of a NiMH or NiCd cell - 10.8 volts. The total voltage for the six-cell version is six times 1.2 volts if you use rechargeable D or C cells - 7.2 volts - or six times whatever alkaline batteries put out into this rather exciting load if you decide to use them instead. Even alkaline D cells can't drive a Tesla-6 lamp to full brightness; six fresh D cells will only manage about 7 volts in one of these lights, though they'll last a heck of a lot longer than alkaline AAs would in the other T-6 version. All of this means that there's one T-6 lamp for the six cell variant, and one for the nine cell. The wiring's simple enough - two strings of three LEDs each for the nine cell, and three strings of two LEDs for the six cell. Regrettably, my review six cell T-6 had accidentally had its lamp swapped with a nine cell model, so when I powered it up I got very unimpressive output. The unlucky customer who got a six cell lamp on his nine cell flashlight had it even worse, of course; his light was very bright for a brief period of time, and then the lamp went pop and he filed a warranty claim. My problem was less expensively solvable; I just had to rewire the lamp. ...then balanced all the little reflectors on the LEDs, screwed the face assembly down onto them (hint: to stop the lens and O-ring falling out, use a couple of bits of sticky stuff on the outside, which you can remove after the assembly's complete), retested it - and discovered to my frank astonishment that it still wasn't shorted. Anyway, now it was time for the brightness tests. According to Elektro Lumens, a Tesla-6 running from NiMH cells should manage better than eight thousand lux at one metre. That's a lot. A standard 6D Maglite with its beam tightened to its narrowest setting only manages a bit more than 7000 lux at one metre, and that's from a roughly 10 degree beam; widen it to match the Tesla-6 and it'll drop to an average (glossing over whatever rings and holes-in-the-middle the lousy yellow incandescent beam gives you) of maybe 3000 lux, with a following wind. Alkaline D cells were not very happy in the Tesla-6. The middle of the hot spot scored only around 4200 lux at one metre. Which is a lot, but also a long way short of the promised brightness. Really fresh alkalines deliver rather more than their nominal 1.5 volts, but hooking six of them up to the T-6 lamp dropped their combined voltage from around 9.6 volts to a miserable 6.85V, which in turn sagged in a matter of seconds down to 6.80. That's 1.13 volts per cell, which for brand new alkalines - D cells, yet - clearly indicates that you're being exceedingly nasty to your batteries. Hooking an ammeter up in place of the tailcap showed that the lamp was drawing about two amps - and would have been drawing a bit more, without the extra resistance of the meter. Check out an ordinary sort of datasheet (PDF) for alkaline Ds and you'll see that the discharge current graph cuts off at one amp, as well it should; D cells are pretty beefy, but the alkaline chemistry just isn't made to deliver really high currents. You can see where the graphs are going, though, and runtime will clearly start getting pretty ugly out there in two-amp land. So it was NiMH time. Or, more accurately, time to buy some NiMH D cells, because I didn't have any and Elektro Lumens very fairly gave me the free flashlight, but not a bunch of free rechargeables to go with it. Big NiMH cells are a significant investment even without a charger. I bought myself six peculiar-brand allegedly-nine-amp-hour Ds cheap on eBay, but still paid $AU74.50 delivered. It's not hard to pay twice as much. If you're a real penny-pincher then you could look for D-sized NiCd cells (cheaper, lower capacity, but likely to last for rather more charge cycles, so used batteries stripped out of some not-charged-too-often gadget may work just fine), but you're not likely to save a whole lot more. If you get a T-6 that runs from AAs then, on the one hand, alkaline power is utterly out of the question, but on the other, AA NiMH cells are pretty cheap. You'd want 'em to be, given how much less energy they give you; a set of nine 2400mAh AAs can provide four-tenths of the energy of six 9Ah Ds. Probably a bit less, if you're working the cells really hard, as you will be in a T-6. Voltage sag isn't an issue for NiCd or NiMH cells in most applications, because their chemistry has much lower internal resistance than equivalent non-rechargeable batteries and can thus deliver much more current, but 8000 lux from a pocketful of AAs is stretching it, even for rechargeables. You can get simple plastic adapters that let you put AA cells into devices that expect Cs or Ds. That'll save some money, at the price of run time; it's not a good idea for a six cell T-6. There are also cheap rechargeable D cells which have the same capacity as cheap rechargeable C cells, because they are C cells, in a bigger casing; they're just kind of pointless in a D-cell T-6, since you might as well just get the C-cell model. OK. Anyway. With six NiMH D cells in it, the T-6's output shot up from 4200 lux to... 5200. Hmm. It was meant to be better than 8000? The current was higher than alkalines had managed, at about 2.5 amps, but the thing was meant to be pulling about three amps from rechargeables. The resistance of the meter doesn't account for that big a difference, and the meter wasn't even connected when I was measuring the lamp brightness. So I took it all to bits again to see what I'd done wrong. The messy rewiring job actually seems to be OK, but I suppose I might have twisted one or more of the little LED contacts (you don't get big easy solder pads on an Emitter like you do on a Star). No way to make that any better, so I turned my attention to lousy connections elsewhere. 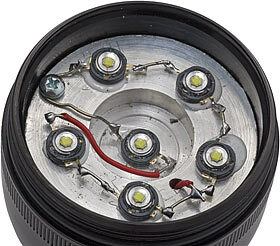 As is normal for metal-bodied flashlights, Maglites use their body tube as part of the lamp circuit - the spring in the tailcap connects the negative end of the battery stack to the chassis of the light. The tailcap threads are covered with the same tough nonconductive anodised coating as the rest of the light, though; the actual contact's made around the edge of the tailcap. So I took the cap off and scratched up the contact surfaces. The Tesla-6 also uses an ugly but effective plastic widget that sits where the old bulb went and transfers power through a simple screw to the solder on the back of the new lamp assembly. So I gave each end of the screw a kiss with a file, and re-blobbed the solder. All that improved the output, but still not to the quoted figure - I got a constant 6000 lux now, or a bit more just after turning the light on, before the D cells had taken fright. You can expect some output variation in bright LEDs in general, and super-powerful LEDs in particular. Unless the flashlight manufacturer's carefully grading the LEDs they get, no two white lights will have exactly the same output brightness or colour tint. 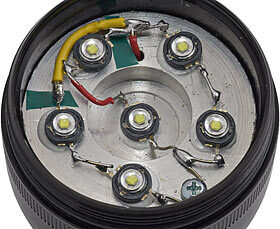 The major LED manufacturers all grade their products already (see "Grade B LEDs? ", here), but it's still kind of like trading cards. Going from 8000 to 6000 lux, though, is far more than LED variation can account for. I'm satisfied that Elektro Lumens aren't just lying about what the light can do, though, so I reckon it's my abuse of the LEDs while rewiring the lamp that accounts for most, if not all, of the discrepancy. Before I rewired the lamp, the flashlight's output was of course singularly un-thrilling, but even then it was a heck of a lot brighter than save-your-life-in-a-cave light. 650 lux at one metre, to be exact, at a current draw of only about 150 milliamps through the meter. The thing'd get an easy hundred hours of run time out of a set of alkalines at that draw, plus a great deal more at lower brightness, but few people will put up with a darn great club of a flashlight for only 650 lux. After rewiring the lamp, fiddling with my bench power supply showed me that the rewired lamp started to give a ghostly green glow from the LEDs (you don't get white until there's some significant output from the blue dies under the phosphor coating) from about 4.7 volts, and made it to save-your-life brightness from about five volts upwards. At 5.3 volts, the rewired lamp was drawing 20 milliamps; that'd be less than 0.9 volts per cell, and a current draw that D cells flattened to that point could easily handle for quite a few more hours. This isn't news, of course; all LED flashlights except those driven by particularly uncompromising DC-to-DC converters will keep delivering a trickle of light for a remarkably long time after the point where an incandescent bulb's slid down the spectrum into uselessness. But it's still nice to see that the T-6's monster array lives up to expectations in this department. While I was fooling with the bench supply, I wound the current up some more; it took seven volts to get the current draw up to the specified three amps. That gives six 1.2 volt rechargeables a bit of sagging room, and leads me to think that my rewired lamp is actually still OK; maybe there's extra resistance somewhere else. Experiments will continue. If, as in my LumaRay FL12 review, you assume minimum useful illumination is the approximately one lux of full moonlight (where most people's cone cells are just starting to work, so colour is just starting to become visible), my not-as-bright-as-it-should-be T-6's NiMH-battery beam is useful out to a distance of about 75 metres. 0.1 lux is about the minimum for decent visual acuity for people who don't have phenomenal eyesight; the Tesla-6 manages that at about two hundred and fifty metres. A Tesla-6 that manages the quoted 8000-plus lumens at one metre, though - say, 8100 - will manage one lux at 90 metres, and 0.1 lux at 300 metres. And it'll run for between two and three hours from 9 or 10Ah NiMH cells (which'll warm up with constant use and not deliver quite as much energy as their capacity figure suggests, and which may not actually have that much capacity anyway if they're cheap cells). That, for people keeping score at home, is a whole lot of light for a very usefully long time. The AA-cell T-6 won't shine for nearly as long, of course, but you still ought to get the thick end of an hour of life out of nine modern high-capacity AA NiMH cells. They may be rather warm when they come out of the light, though. All versions of the Tesla-6 cost $US169.99, without batteries. This ain't cheap, but neither is it expensive, by the standards of surprisingly bright boutique lights - nottomention various exotic "tactical" lights which, unlike the Tesla, will hardly kill someone at all if they're hit with them. If you think of the T-6 as six flashlights in one, which it kind of is, then you're paying less than $US30 per light. You can't just order a T-6 - or QuadStar, or Pentalux - from the regular Elektro Lumens For Sale page; these lights are made to order, and you have to call or e-mail to line one up. The Tesla-6 won't be alone at the top of the Elektro Lumens range for much longer. 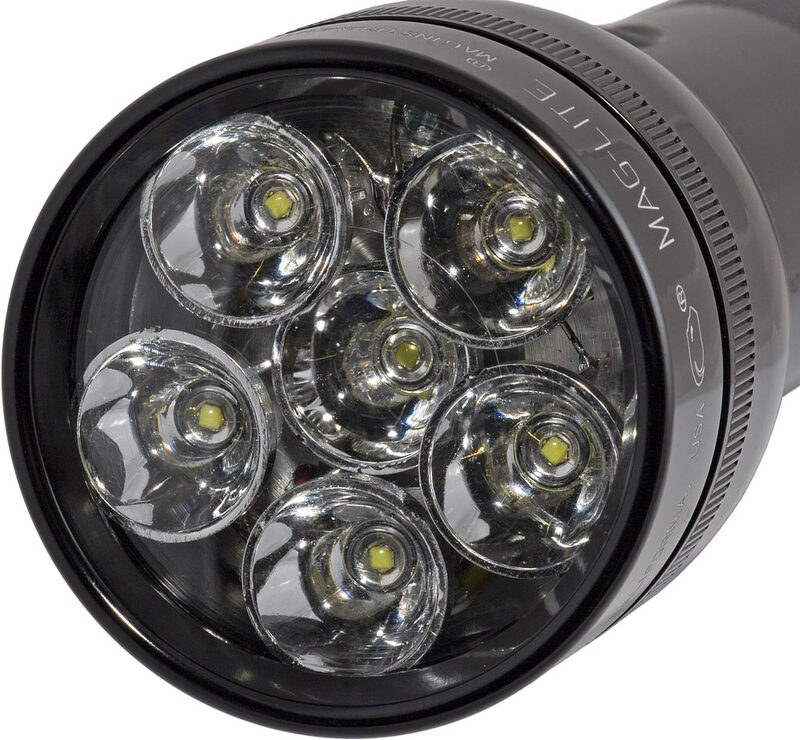 The new ELX-6 is flashlight-shaped but intended for use as a bike light; it runs six Luxeon IIIs from nine AA cells, for considerably higher lux-at-one-metre than the T-6 can manage, because it's got bigger reflectors and a narrower beam. It's fully custom made, not a refitted version of anything else, and it comes with batteries and a charger. The ELX-6 isn't, as I write this, quite available yet - there's a click-here-to-order link that leads to a product code that doesn't actually exist in the shopping cart application. But by the time you read this, you may well be able to lay your (gulp) $US300 on the table for one. For around two thirds of the price, though (battery prices make the calculation fuzzy), the T-6 retains a lot of charm, despite being an unashamed hack job. I have previously expressed my affection for the 6-D Maglite. The Tesla-6 is, quite simply, as bright as one of those can be made with current LED technology. You could make a light that's brighter yet by enlarging the head or throwing electrons through space, but the first option's inelegant and the second can get surprisingly expensive very quickly indeed. Sticking with the standard Mag form factor makes the light easier to handle, and standard Mag accessories will still work. The Tesla-6 is, however, unquestionably just a little over the top. If you're too sensible to buy a T-6, the less crazy $US149.99 QuadStar is probably the pick of the Elektro Lumens multi-LED light crop. It runs from six AA cells in a 2-D-sized light using a pair of adapters, and the lower LED count means it gets to use the same 20mm reflectors (versus the 17mm ones in the Pentalux and Tesla-6) that the ELX-6 has, so you get a tighter beam. Elektro Lumens will, also, some time fairly soon, be offering more professional looking QuadStar lights, and an extra LED or two can apparently be shoehorned into that design without too much trouble. And, I remind you, if you want a more normal sort of flashlight that doesn't look as if it was concocted by a wild-eyed guy in a laboratory full of bubbling glassware, you should just get a Blaster, and be merry. Those seeking a mildly Mad Max LED flashlight that could be used to propel a solar sail, on the other hand, will be well served by a Tesla-6. Review Tesla-6 kindly provided by Elektro Lumens.